TTid represent a wide range of the world's leading manufacturers. For many of the manufacturers listed below we do not list all their product range. In addition, many product ranges are modular or have a huge options list. For this reason, if you have a requirement for which you can't immediately see an appropriate product listed, please contact us to discuss your requirements. Aim-TTi has been designing and manufacturing electronic test and measurement equipment and laboratory power supplies in the UK since the 1980s. 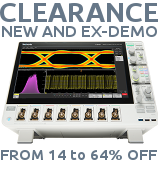 Product highlights include innovative Powerflex DC power supplies, hand-held RF spectrum analyzers, arbitrary function generators and many more. The AMREL brand boasts the award winning eLOAD line of Air and Water-cooled Electronic Loads up to 200kW+, 5000Adc and 1200Vdc ratings. Electronic loads have found a variety of applications ranging from power converter testing to current modulation. A large range of power sources can be tested using an electronic load from converters, inverters and UPSs to electrochemical sources such as batteries and fuel cells. Please contact us for details of Amrel equipment that is available in the UK or for alternatives where Amrel equipment is restricted for import. TTid is the exclusive importer and distributor for Astrodyne TDI Dynaload products in the U.K. We provide full sales & technical support for all Dynaload products. Our sales engineers will be pleased to discuss your technical requirements or to demonstrate products to you. B&K Precision offers a range of general testing and measurement instruments. Core products include power supplies and DC electronic loads, signal generators (especially function and arbitrary generators), component testers, oscilloscopes, spectrum analyzers, and multimeters. They also offer device programmers, video and cable testers, electrical and battery testers, and environmental testers and a comprehensive array of probes, leads, adapters, and additional accessories that make testing easier. Initially we are only providing listings for the B&K Precision power products - please contact us for details of any other type of B&K products. California Instrument AC power sources are used in R&D, test and measurement, avionics testing, inverter testing, arbitrary waveform generation, bulk power and power conditioning applications across a wide variety of industrial segments. California Instruments' main product line is comprised of AC programmable power sources, AC power supplies, AC power sources and AC compliance testing. Products range from 800VA to 480kVA, 0V to 600V and 0A to 1,500A. Founded in 1984, Chroma ATE Inc. is a leading supplier of precision Test and Measurement Instrumentation, Automated Test Systems, Manufacturing Execution Systems and Turnkey Test and Automation Solutions marketed globally under the brand name "Chroma". Elettrotest originally made instruments for measuring power, voltage and current for industrial systems. To this was added specialist equipment for measuring the characteristics of asynchronous motors, including the indirect measurement of the temperature changes during operation. The range was gradually extended to control systems for various civil and industrial applications and in particular to thermostatic control for heating and cooling plus a range of programmable stabilized AC power supplies which are increasingly used for lab and line testing. Elgar is a division within AMETEK that is a leading global manufacturer of AC Programmable Power Supplies. Elgar AC power supplies are used in R&D, test and measurement, avionics testing, inverter testing, arbitrary waveform generation, bulk power and power conditioning applications across a wide variety of industrial segments. The main products in the Elgar product line are AC programmable power sources, AC power supplies, AC power sources and AC compliance testing ranging from 800VA to 480kVA. The voltage ranges from 0V to 600V and the current ranges from 0A to 1500A. Please contact us for details of Elgar equipment that is available in the UK or for alternatives where Elgar equipment is restricted for import. FLIR Systems is the world's largest commercial company specializing in the design and production of thermal imaging cameras, components and imaging sensors. Fluke are the acknowledged world leader in handheld test instruments covering every area of electronic, electrical and environmental test. Their bench instrument range similarly includes many class leading products. HAMEG Instruments GmbH has been designing test equipment in Germany since 1957. HAMEG was taken over by Rohde and Schwarz in 2005 and production was moved from Germany to the R&S facilities in the Czech Republic in 2010 although the autonomy of HAMEG Instruments as a subsidiary of Rohde & Schwarz with R&D, product management, sales and service remained. This was followed by the HAMEG products being re-branded "Rohde & Schwarz HAMEG" from 2012 to 2014 and are now (since 2014) branded simply "Rohde & Schwarz". Please click on the R&S logo below to see the existing product range. Magna-Power designs and manufactures robust current-fed programmable DC power supplies that set industry standards for quality, size and control. The company’s experience in power electronics is reflected in its 1.5 kW to 2000 kW+ product line, quality service, and reputation for excellence. Pico Technology has been designing and manufacturing test equipment in the UK since 1991 and is now widely regarded as being the leading producer of USB linked PC digital oscilloscope and data acquisition products. Although the product range started out with extremely simple low tech products, Pico Technology range now extends to high-end multi-channel 20GHz sampling oscilloscopes and associated products such as arbitrary waveform and differential pulse generators among others. Prism Sound has been designing and manufacturing successful high quality analogue and digital audio test solutions in the UK since 1987. The dScope Series III audio analyzer has been the mainstay of the company's products in recent years and its capabilities have been extended to include direct testing of Windows sound devices such as Bluetooth, USB and installed audio devices. Peripherals such as audio switchers and digital interface adapters complete the range. Rohde & Schwarz GmbH & Co KG is an international electronics group specializing in the field of electronic test equipment since 1933 with a focus on wireless communications. Rohde & Schwarz acquired HAMEG Instruments in 2005 and all HAMEG equipment has been rebranded Rohde & Schwarz since 2014. TTid historically has only represented the HAMEG range of instruments so this site focuses predominantly on those instruments within the R&S portfolio that were once HAMEG and are now part of the "Value Instruments" range. Sorensen DC power supplies are used in R&D, test and measurement, process control, power bus simulation and power conditioning applications across a wide variety of industrial segments. The Sorensen brand product line includes DC programmable power supplies, DC linear power supplies, DC benchtop power supplies and DC modular power supplies ranging from 30W to 150kW. Vitrek is a leading US manufacturer of high voltage test and power measurement equipment. TTid provide full sales and technical support for all of these products in the UK. VTI Instruments (formerly VXI Technology) is a leading supplier of high-density modular test, measurement and data acquisition instruments. The company’s products and systems are used to monitor and record data that characterizes the physical integrity and performance of aircraft, engines, and other large structures, as well as to automate the functional testing of complex electronic systems. A particular specialization is large scale multi-channel data acquisition and control achieved with modular and virtual instruments. VTI Instruments is an Ametek company. Yokogawa has been manufacturing electronic test equipment in Japan for over a century and has contributed to numerous industries through its supply of test and measurement equipment. Yokogawa measuring instruments are used worldwide in development and production of electrical, electronic, and automotive equipment. The Yokogawa test and measurement range consists of many hundreds of products, many of which are modular. Only a small proportion of these are listed on this website. Please contact us for more information.